тЙУ. 16.1. чЕЗЕФБФЙЧОБС ОЕТЧОБС УЙУФЕНБ Й ЙО ОЕТЧЙТХЕНЩЕ ЕА ПТЗБОЩ--НЙЫЕОЙ. (б) пУОПЧОЩЕ ПУПВЕООПУФЙ УЙНРБФЙЮЕУЛПК ОЕТЧОПК УЙУФЕНЩ, ЧЛМАЮБС РБТБЧЕТФЕВТ МШ ОЩЕ ЗБОЗМЙЙ, РЕТЙЖЕТЙЮЕУЛЙЕ ЗБОЗМЙЙ Й НПЪЗПЧПК УМПК ОБДРПЮЕЮОЙЛПЧ. (ч) вПМЕЕ ПЗТБОЙЮЕООЩК ЧЩИПД РБТБУЙНРБФЙЮЕУЛПК ОЕТЧОПК УЙУФЕНЩ Й ЙООЕТЧЙТХЕНЩЕ ЕА ПТЗБОЩ. Fig. 16.1. 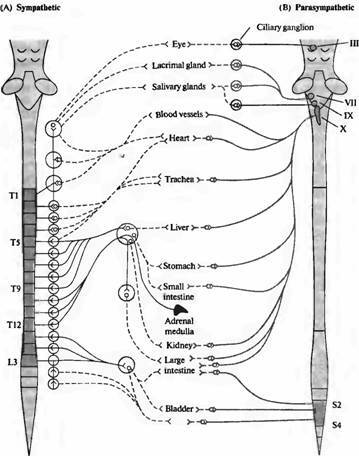 The Autonomie Nervous System and the target organs that it innervates. (A) Principal features of the sympathetic nervous system, including the paravertebral ganglia, peripheral ganglia, and adrenal medulla. (B) The more restricted output from the parasym-pathetic nervous system and the targets that it innervates. Solid lines are myelinated preganglionic axons; dashed lines are un myelinated postganglionic axons. ЛЙЫЕЮОПК НПФПТЙЛЙ. рБТБУЙНРБФЙЮЕУЛБС БЛФЙЧБГЙС ЧЩЪЩЧБЕФ РТПФЙЧПРПМПЦОЩЕ ЬЖЖЕЛФЩ: УХЦЕОЙЕ ЪТБЮЛБ, ЪБНЕДМЕОЙЕ ТЙФНБ УЕТДГБ Й ХУЙМЕОЙЕ НПФПТЙЛЙ ЛЙЫЕЮОЙЛБ. у ДТХЗПК УФПТПОЩ, УЕЛТЕГЙС ЦЕМЕЪ НПЦЕФ ВЩФШ ХУЙМЕОБ РТЙ БЛФЙЧБГЙЙ ЛБЦДПК ЙЪ ЬФЙИ УЙУФЕН. пВЕ УЙУФЕНЩ НПЗХФ ЧЩЪЧБФШ УПЛТБЭЕОЙЕ ЙМЙ ТБУУМБВМЕОЙЕ ЗМБДЛЙИ НЩЫГ, Ч ЪБЧЙУЙНПУФЙ ПФ ФПЗП, ЛБЛПК НЕДЙБФПТ РТЙ ЬФПН ЧЩУЧПВПЦДБЕФУС, Й ПФ ФПЗП, ЛБЛПЗП ФЙРБ ТЕГЕРФПТЩ РТЙУХФУФЧХАФ Ч НЩЫГЕ. фБВМЙГБ 16.1.фЙРЙЮОЩЕ ЬЖЖЕЛФЩ БДТЕОЕТЗЙЮЕУЛПК УЙНРБФЙЮЕУЛПК Й ИПМЙОЕТЗЙЮЕУЛПК РБТБУЙНРБФЙЮЕУЛПК ОЕТЧОЩИ УЙУФЕН. 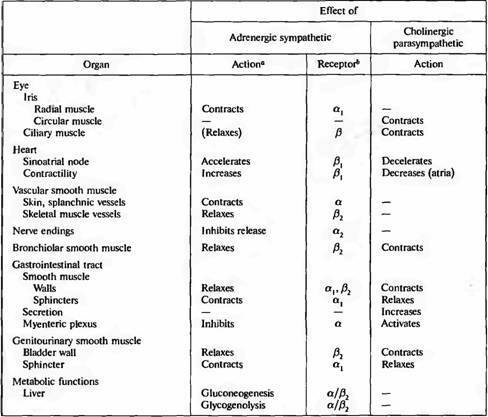 Table 16.1.Characteristic actions of adrenergic sympathetic and chohnergic parasympathetic nervous systems. њ Accounts of the actions of the autonomie nervous system on target organs listed in this table that are not dealt with in this chapter are given in reviews and textbooks of physiology and pharmacology (see references in text). * Not all the adrenergic receptors or effector cells are included; purinergic, peptidergic, and cholinergic mechanisms are dealt with in the text. Whereas epinephrine acts on all the adrenergic receptors, norepinephrine is effective on α,, α, , and /3, receptors, but not /J2. The various types of adrenergic and muscarinic receptors are characterized by the specific agonists and antagonists that bind to them, and by their molecular structures. ЛТПЧЕОПУОЩИ УПУХДПЧ, ЛПФПТЩЕ ОЕЮХЧУФЧЙФЕМШОЩ Л ОПТБДТЕОБМЙОХ. ч ПФМЙЮЙЕ ПФ ОПТБДТЕОБМЙОБ, БДТЕОБМЙО НПЦЕФ ЧЩЪЩЧБФШ ЛБЛ ТБУЫЙТЕОЙЕ, ФБЛ Й УПЛТБЭЕОЙЕ ЛТПЧЕОПУОЩИ УПУХДПЧ. ч РТПФЙЧПРПМПЦОПУФШ ЬФПНХ, РБТБУЙНРБФЙЮЕУЛБС ОЕТЧОБС УЙУФЕНБ СЧМСЕФУС ВПМЕЕ ЙЪВЙТБФЕМШОПК Ч УЧПЕК ДЕСФЕМШОПУФЙ. еУФШ УХЭЕУФЧЕООБС ЧЩЗПДБ Ч ФПН, ЮФП ЪТБЮПЛ НПЦЕФ УПЛТБЭБФШУС РТЙ СТЛПН ПУЧЕЭЕОЙЙ, Б ИТХУФБМЙЛ ЗМБЪБ — БЛЛПНПДЙТПЧБФШУС ДМС ТБУУНБФТЙЧБОЙС УПУЕДУФЧХАЭЙИ ПВЯЕЛФПЧ ЙЪВЙТБФЕМШОП, ВЕЪ УПРХФУФЧХАЭЙИ Й ЧЕУШНБ ОЕУЧПЕЧТЕНЕООЩИ УПЛТБЭЕОЙК НПЮЕЧПЗП РХЪЩТС МЙВП ЕЭЕ НЕОЕЕ ХНЕУФОЩИ РБТБУЙНРБФЙЮЕУЛЙИ ЬЖЖЕЛФПЧ.